Some decisions around the sculpture of Sir Nigel Gresley were easily made. What better spot for a sculpture of Sir Nigel Gresley than the new Western Concourse at King’s Cross station? Sir Nigel Gresley was Chief Mechanical Engineer for London & North Eastern Railway (LNER) there between 1923 and 1941. It was also clear that we all wanted a larger-than-life sculpture of this larger-than-life man. We knew that we wanted him to be depicted in his late fifties/early sixties. This was the height of his influence, around the time of the record-breaking run of the Mallard. We agreed that he should be wearing a three-piece work tweed suit, given that he will be at his place of work. Further discussions with the Gresley Society Trust ensued. The questions still faced were many. Should he be sculpted holding tools of his trade, like a slide-rule or a chronometer ? Or should he be shown surveying the new concourse, with his old office building as a backdrop? How could we engage the public, including younger generations, that would not recognise his face or know of his achievements? I was commissioned to sculpt three maquettes (or small models) to help make the final decision on the pose. Whereas painters tend to sketch out their ideas in two-dimensions, sculptors tend to sketch out their ideas in three-dimensions, in clay or wax. I use terracotta wax onto a metal armature so that I can move the pose if required. Here are the three rough maquettes in terracotta wax – from left to right, Sir Nigel with slide-rule in hand, looking out across the concourse with a mallard duck at his side, and with a chronometer in hand. 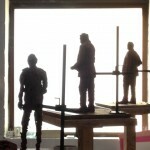 The Sculpture Group members of the Gresley Society Trust came to my Billingshurst studio to see the maquettes and decide which was to be taken forward, in bronze. The decision was unanimous.